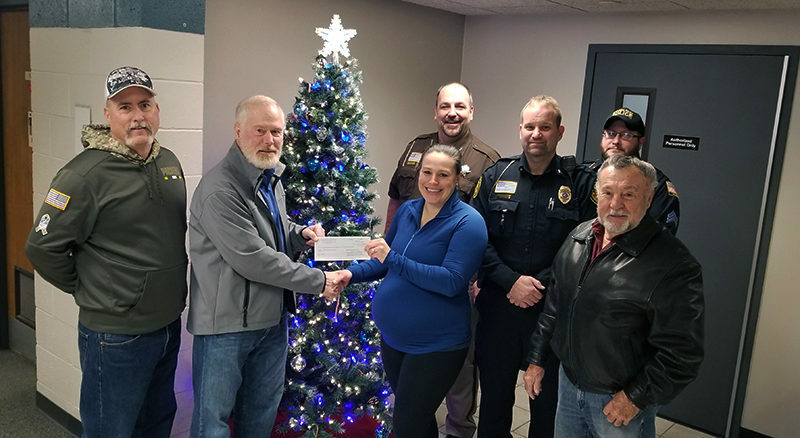 The Stevens Point Guns N’ Hoses committee helped close out the first 10 years of Never Forgotten Honor Flight on Wednesday with a donation of $4,500. The group was organized by Police Chief Kevin Ruder (Ret.) and Traci Tauferner, a health provider who met Ruder when she assisted the city with employee physicals. The two launched the first annual Guns N’ Hoses softball game five years ago, and since then they’ve taken in almost $70,000 in local donations. Honor Flight, a national network of regional hubs, flies military veterans, free of charge, for a day of sightseeing at the memorials constructed in their honor at the nation’s capital. The central Wisconsin hub is overseen by veterans James Campbell and Mike Thompson. Thompson said the group just completed its 34th flight—or, “Mission”, as they’re called—in October, taking almost 400 senior vets from WWII, the Korean Conflict and the Vietnam War to Washington, D.C. It’s referred to as “the trip of a lifetime”, Thompson has said, because the day is filled with emotion, and for many veterans, a sense of overdue closure. With help from multiple local law enforcement and fire agencies, the Guns N’ Hoses group has held an annual softball game to engage the public and help raise awareness. Two years ago, the group added a race event at Golden Sands Speedway. Since then, the group has raised $69,500 from private citizens and local businesses to give Honor Flight, which spends $500 to fly each veteran on the one-day trip. “You guys have been one of our gold star supporters,” Thompson told the Guns N’ Hoses group on Wednesday. Thompson said the donations have paid for 247 Portage Co. veterans to take the trip, but added there are 124 still on the waiting list. The Guns N’ Hoses group also gave a $10,000 donation in November to Ageless Aviation Dream Flight.